← How to show processing information by VeryPDF PDF Toolbox Command Line ? Wanna convert PDF to TIFF? Due to its high portability, TIFF is widely used for images from optical scanners, graphics or photo editing applications. What if you have a lot of PDF file at hand but you need to maintain compatibility with the annotation format? The best way is to convert PDF to TIFF. With the help of VeryPDF PDF to Any Converter, you can easily and quickly convert PDF to TIFF. TIFF is the abbreviation of Tagged Image File Format, which is a raster-based file format commonly used to exchange raster graphics (bitmap) images between different applications such as 3-D application, desktop publishing application, faxing application, medical imaging application. TIFF files can be in gray scale, color palette, or RGB full color. The 1st step is to download and run VeryPDF PDF to Any Converter. Download and install it from the download links if you have not yet install it. Double click its shortcut on the desktop to run it if you have already installed it. The 2nd step is to add PDF files and click [PDF to Images]. There is no sequence between adding the PDF files and clicking [PDF to Images]. You can click [Add] to add the files before/after clicking [PDF to Images]. If you add the wrong PDF files and you want to undo it, you can delete the PDF files one by one via [Delete] button and delete all by [Clear]. The 3rd step is to select TIFF from the format list. After open the “Basic Setting” interface via clicking [Setting] button on top of the main interface, please choose TIFF from the image format list. Click [Apply] to make your selection enact. 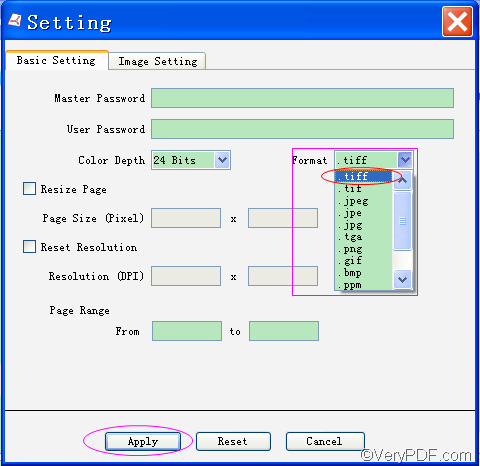 Moreover, you can do some setting in both the “Basic Setting” interface (such as choose the type of the color depth, resize page, reset the resolution in DPI and choose the conversion page range) and the “Image Setting” interface (such as choose the TIFF compression method, choose if convert the PDF file into multiple page TIFF file and set the file name template). The 4th step is to choose storing place for TIFF and start the conversion process. Choose a storing place for the output TIFF and click [Start] to convert PDF to TIFF. Any questions about how to convert PDF to TIFF with VeryPDF PDF to Any Converter, you can contact our support team. This entry was posted in VeryPDF Blog and tagged convert PDF to TIFF. Bookmark the permalink.